At last night’s meeting of F1 Anonymous. The group nods knowingly, glancing at each other. Some eyes grew wide at the temptation. One man wiped his brow. As an F1 fan in the United States, it’s been an uphill battle for many years. In fact, I watched Wide World of Sports and Sunday races for years as a kid, but then I got interested in other things and stopped watching and following F1 for a long time. It was not hard to do. I enjoyed the SPEED coverage when I first came back to F1 about 5 years ago. But then I found Sidepodcast and I heard the UK coverage for the first time. I did not know what I had been missing. I just couldn’t go back. SPEED had the three commentators sitting in a little room in Charlotte, North Carolina watching the world feed and timing and scoring. The pit reporter is the only one actually at the race. And that pit reporter/hype man is Will Buxton, who was hired when Peter Windsor left. I know some people enjoy Buxton’s work, but he drives me nuts. SPEED coverage wasn’t bad for what it was, it just wasn’t enough for me. Apparently SPEED is beginning the process of changing over from all-motorsports programming to covering all different kinds of sports. They want to compete with ESPN. So SPEED coverage is done. The NBC Sports Group has signed the exclusive rights to Formula One coverage with Formula One Management for four years, complementing their IndyCar race coverage. We will now have almost all open wheel racing on one network except for a few IndyCar races on ABC, including the Indy 500. Four F1 races will be on the NBC regular network; Canada, Abu Dhabi, the U.S. and Brazil. The other sixteen races will be shown on their cable station, the NBC Sports Network. For the first time since I came back to F1 all three practice sessions, qualifying and the race will be televised. But will they be live? I don’t know. All of the races will be streamed live, with mobile and tablet apps, on NBCSports.com, and they’re promising 100 hours of programming. But will the races be live on TV or are they only going to stream them and show the races on a time delay to try for better ratings because only addicts who are not in F1 Anonymous will watch them? Steve Matchett analyst. I love his commentary. I learn so much. Leigh Diffey play by play. He is also doing IndyCar this year, plus Grand Am/Continental Tire Series. Busy boy. TV coverage of Free Practice 1 and Free Practice 2. More F1 can only be a good thing, even if Will Buxton is part of that deal. Maybe he’s what US coverage needs to get more viewers. No more interruptions of F1 for NASCAR Truck practice. Dedicated fans will find a way to watch, via dodgy links, etc. If this gets some casual fans to see more races, good. 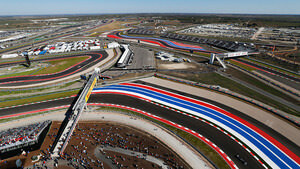 With Circuit of the Americas now on the schedule, we actually have a track now. David Hobbs getting things wrong and saying ‘clag’ all the time. I’m not a fan. Will it be televised live and then re-aired? How many presenters will be on the ground at each race? Will it just be the pit reporter again? With Leigh Diffey working in different racing disciplines, that leads me to believe it’ll be the same thing as SPEED with a remote studio for the presenters. Remember the Olympics and NBC’s coverage? It was terrible. The creation of this Twitter account should be an indication: @NBCDelayed. I hope NBC Sports has serious F1 fans on staff who understand and care about what real fans want. I know that’s a somewhat naive fantasy, but a girl can dream. Now that we have a track in the U.S. and hopefully two races in the near future, we have an opportunity to expand the fan base and to once and for all eliminate the need for F1 Anonymous because the junkies may finally get the fix we need. But, we’ve been burned before, so I’ll wait and see. I know the U.S. isn’t the only place in the world that it can be tough to watch F1. We all have our different challenges. I have it on good authority that Steven Roy is a member of F1 Anonymous and he’ll be sharing his story soon.